DEADLY CLASS isn’t exactly a realistic portrayal of life for the average teenager. The school young Marcus Lopez attends is Kings Dominion School for the Deadly Arts, which educates its students on murder. His peers are killers-in-the-making, or killers already, who are simply refining their craft, and have developed inseparable cliques within their fiefdom. It’s not a nice place but then, for a large portion of students, what school is? Despite the hyperbolic events of Rick Remender and Wes Craig’s tale, there is an undeniable authenticity to Lopez’s reactions to the cards life has dealt him. His parents are dead and he has been living on the streets; he is constantly surrounded by absolute despair. So it’s only natural his perceptions have been warped, and that elements of his sanity have been stripped. 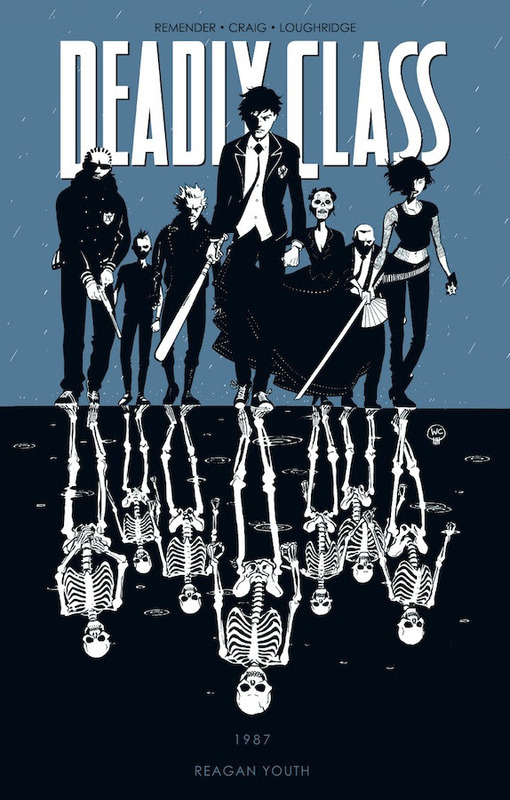 Lopez is in no way likable; in fact, there are few (if any) redeeming characters in this first volume of DEADLY CLASS – but we understand how things got to this point; how life has chipped away at this young kid, and turned him into a vengeful, amoral monster. The exaggerated violence and the fantastical portrayal of an acid trip are masterfully rendered by Wes Craig (aided by Lee Loughridge on colors), but without Remender’s robust narrative the collection would devolve into capricious absurdity; pretty to look at, but without any meat on the bone. Remender weaves a large cast of characters into the story, but the spotlight remains firmly on Lopez, whose internal monologue gradually humanizes him, allowing readers a glimmer of hope for the boy’s future; maybe he’s not as bad as he wants us to think; maybe he has a shot at redemption. I’ll certainly be reading on to find out.